This visor strip is based on Bell's template with a contour suitable for the curvature of Bell Motorsport visors. Feedback from our customers suggest this will also fit Arai, Stilo and OMP Motorsport visors too. As with all our visor strips, this strip can be customised with your choice of text or logos free, just use the select boxes, if you require a logo please enter : 'LOGO' followed by the logo you require, If you require a particular font that is not listed within the options list, please contact us and we will endeavour to meet your requirements. 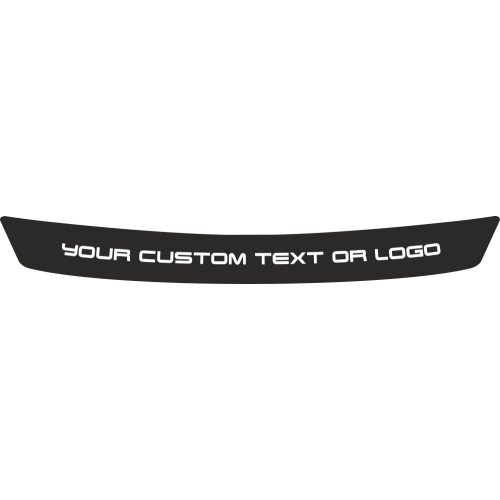 Visor strip is cut from a single colour; please choose your colour option from the drop down box, second colour selection is for your text or logo colour. We can add additional colours but this may attract a small price increase, please contact us if you wish to discuss this option. * If you plan to apply a visor strip to an Iridium coated visor we cannot accept any liability for damage to the coating of the visor, iridium coatings are very fragile and you should be prepared for the coating to be damaged should you remove the visor stip. 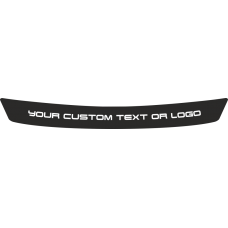 The graphic shown is an accurate depiction of the decal you will receive, the area in black is the main visor strip, the preview shows the custom text in white.